A song to play while you read about the Rangers: “It’s Gonna Take a Little Bit Longer” by team minority owner Charley Pride. There was little fanfare for Arlington Stadium during its last season in 1993. Any sentiment for the stadium itself was overshadowed by the excitement of the new Ballpark in Arlington being built not far away. The celebrations in the last game itself weren’t even about what had happened in the stadium but more about two players that were retiring nine innings later, Nolan Ryan and George Brett. It was born as Turnpike Stadium in 1965 and its first home team was the relocated Fort Worth Cats, rechristened the Dallas-Fort Worth Spurs with their move east. The ambitions of the stadium were never to just be the home of a Class AA Texas League team but to one day attract a major league franchise. The location was even chosen due to being in the middle of Dallas and Fort Worth with easy road access due to it’s proximity to the Dallas-Fort Worth Turnpike, now known as Interstate 30 or Tom Landry Freeway. During the seven seasons the Spurs played there, the team was affiliated with the Cubs, Astros, and Orioles. In 1972 the Washington Senators moved to North Texas and the Spurs were no more as the major league Texas Rangers began playing in the American League West. Bleachers were added to expand the capacity and over the years new scoreboards and billboards were added to the top of the outfield stands. During the next 21 seasons, the Rangers fielded some good but never great teams. Oftentimes, the final standings showed a franchise that was mediocre. In the 28 years that games were played at Arlington Stadium, the only team that qualified for the playoffs was the inaugural 1965 Spurs, who lost a one-game playoff. With the red brick baseball palace being built down the street, it became evident to even the stadiums staunchest supporters that it was nothing more than a Double-A stadium with extra bleachers and boxes. As the Rangers begin to play their final season in Globe Life Park, the team will celebrate the preceding 26 seasons through various promotions, theme nights, and more. During the years in the stadium, World Series games were hosted, All-Star games were had, and the team raised its national profile. The team will even have an Arlington Stadium t-shirt giveaway night. The former Turnpike Stadium now lays under a parking lot and soon the fate of its one-time magnificent replacement is uncertain. While it’s certain that the Texas fans will enjoy being inside a roofed stadium on 103-degree afternoons, it is not certain whether the team will perform like they did at Arlington Stadium or the current Globe Life Park. What can be guaranteed though is that images and memories of the Rangers in their pennant runs that took place in the ballpark will be remembered as the team goes forward, a history denied to their original home. What is the Rangers’ most recent accomplishment? On November 2, 2018 it was announced that Los Angeles Dodgers third base coach Chris Woodward would become the Texas Rangers’ new manager. Woodward brings with him an analytical approach that comes from his experience with the Dodgers, and marks a significant shift from the Rangers’ previous “traditional” approach that resulted in back-to-back pennants but was not quick enough to adapt to a changing AL West landscape. Other new hires such as hitting coach Luis Ortiz, and pitching coach Julio Rangel also come with more familiarity with the creation and implementation of metrics then the previous regime. 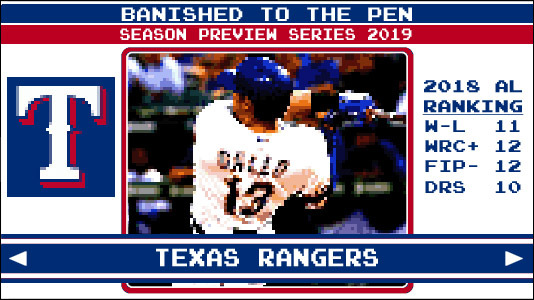 How will the Rangers define success in 2019? General manager Jon Daniels recently admitted that this season is a bit of rebuild as the team implements an analytics-based approach under rookie manager Chris Woodward prior to a new stadium opening in 2020. This season will be a success if the young players and patched together veterans are able to compete in a way that makes 2019 actually matter and not all about looking towards next year. Shelby Miller is the sort of player that already seems old, like he’s in his mid-30’s and winding down a long career when he’s actually only 28 and hoping to rebound. He was 21 when he made his first appearance for the Cardinals and by the following season, Miller established himself as a front of the line starter. He was involved in one high profile trade to the Braves, had an All-Star season, involved in a second high profile trade to the Diamondbacks and then…nothing. His 2016 season was disappointing and then after 4 starts in 2017 he injured his arm and needed Tommy John surgery. The tall Texan attempted a comeback in 2018 but was shut down after 5 appearances. Miller will be one of the four new pitchers in the Rangers projected rotation for 2019 and the other three all have similar stories. Of those four, Miller’s 16 innings pitched in 2018 is second most behind Lance Lynn. Edinson Volquez and Drew Smyly did not pitch at all. The starting pitching is a question mark with its injury history and sparse recent workload to base predictions on. If two or three of these pitchers have decent seasons, it is possible that the Rangers could play to be a .500 team this year. If not, be prepared for a long list of names being brought up from Nashville, Frisco, and parts unknown to do their best to help the team survive a long season. The theme running through this year’s promotions for the Rangers is celebrating the history of Globe Life Park in this, its final season. With an assortment of bobbleheads, knick-knacks and more, the most in-demand item will be due not to the item itself but the day it is given out — the Globe Life Final Game T-Shirt on September 29 versus the Yankees. That being said, my personal favorite is the celebration of a regional fast food condiment staple with the Whataburger Spicy Ketchup Cap Night on September 12.